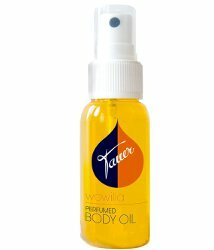 My nomination for the (reasonably-priced) gift most likely to please a perfumista: Tauer Wowzilla Wowilla Body Oil. "Cozy, rich, gourmand: Treat yourself with this luxuriously scented body oil. 93% cold pressed Jojoba oil and 7% of a comfortable rich vanilla perfume. Notes are: Vanilla from la Réunion, Sandalwood, labdanum and patchouli." CHF 25 (right now, about USD $25) with free shipping at Tauer, where you might also want to take a gander at the 300 ml candles in dark blue glass, available in Rose Delight or L'Air du Désert Marocain for CHF 69 each. 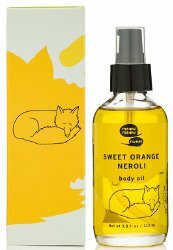 Meow Meow Tweet's Body Oil: "Forget about lotion! Nurture your skin from head to toe with this gentle, moisturizing, and non-greasy oil blend. Scented only with essential oils, massage this luxurious blend of oils into your entire body, put a few drops in your bath, or work a little bit into the ends of your hair to tame and moisturize. Available in a Lavender Lemongrass, Geranium Frankincense and Sweet Orange Neroli." $22 for 112 ml or $10 for 30 ml. Another temptation from Rodin: the Limited Edition Mermaid Collection Olio Lusso Luxury Body Oil. "One remarkable formula for nourishing, silkening, moisturizing. Transports you to far-off shores with a scent that marries ceremonial South India Sambac with the clean oceanic tang of French Sea Kelp. 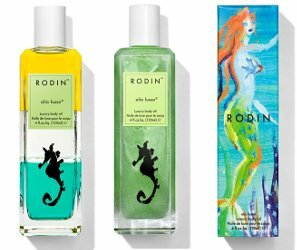 New RODIN oil awakens your inner mermaid. Brings skin to dewy radiance for any season. [...] With a shake, this tricolor oil turns seafoam green. Massage it into your hands, apply to moist, clean skin just after a shower or bath." $90 for 120 ml. 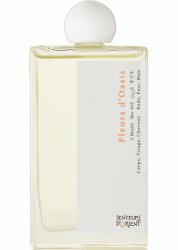 From Senteurs d'Orient (the same people who make those cool soaps), Fleurs d'Oasis Body Oil: "At the center of your daily relaxation ritual lies Senteurs d'Orient's luxurious body oil. This silky formula is blended with eight plant-based extracts and fourteen essential oils that not only nourish the skin, but also restore dry, damaged hair, too. The fresh fusion of Neroli, Red Thyme and Jasmine create a relaxing, spa-like experience in the comfort of your own home." 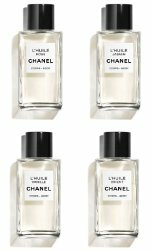 $40 for 75 ml at Net-A-Porter.